Henry Reed in Canadian Poetry, Eh? Reed, Henry: A Map of Verona; Clarke Irwin, Toronto (Cape, London); 59 pp. ; $1.00. In the section called Preludes, Mr. Reed shows a neat wit and humanity in parodies of army instruction and of T. S. Eliot in his oracularly non-committal vein. The more serious poems, through a variety of vividly realised images and legends, explore for the most part problems of personal responsibility and activity, and the individual's relation to the life of the community. The prevailing images are of sea and shore, under extremes of heat and cold, the mood strenuous and the expression tense and forceful. The last poems, which deal dramatically, through the figures of Electra's sister Chrysothemis, and of Philoctetes, with the problem of those who would derive a conscious innocence from a weak amiability, or whom justified resentment might tempt into isolation, combine admirably a sustained relevance to their dramatic situation with a broader reference to problems that are perhaps more pressing and more universal now than they have ever been. The paper is not the best, but the printing and binding compare favorably with Canadian books at double the price. This critique was written by Professor Louis MacKay (1901-1982), who was, at the time, with the Department of Classics at the University of British Columbia, in Vancouver. Hilariously, MacKay was on the staff of the Canadian Forum in 1938 when a poetry chapbook by John Smalacombe, Viper's Bugloss, was submitted for review. MacKay penned a rather unfavorable review (Smalacombe did not "know a sibilant from a snake in the grass"), to which the author replied with a furious, eloquent rebuttal. 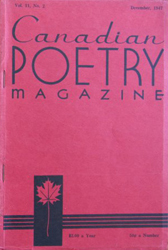 The Forum had already published both Smalacombe's self-defense and a counter-attack by MacKay before the editors detected any hanky-panky: Smalacombe was actually MacKay's pseudonym; it was his own poetry (Earle Birney, Spreading Time: Remarks on Canadian Writing and Writers, 1904-1949, 1989).